Size 18 oz. 32 oz. Got the P5 for Christmas. It is an amazing French press! The filter is awesome. No coffee grit gets past it! I was used to some healthy silt at the bottom and barely any with this press. Best design ever. And this is without the paper filters! Hello CharLea! Thank you for your feedback. We are appreciate it. All the best, FrenchPressCoffee.com. I bought the Espro P5 to include in a coffee basket for a raffle. The basket was the most popular item that day and the winner was extremely pleased with the Ps. 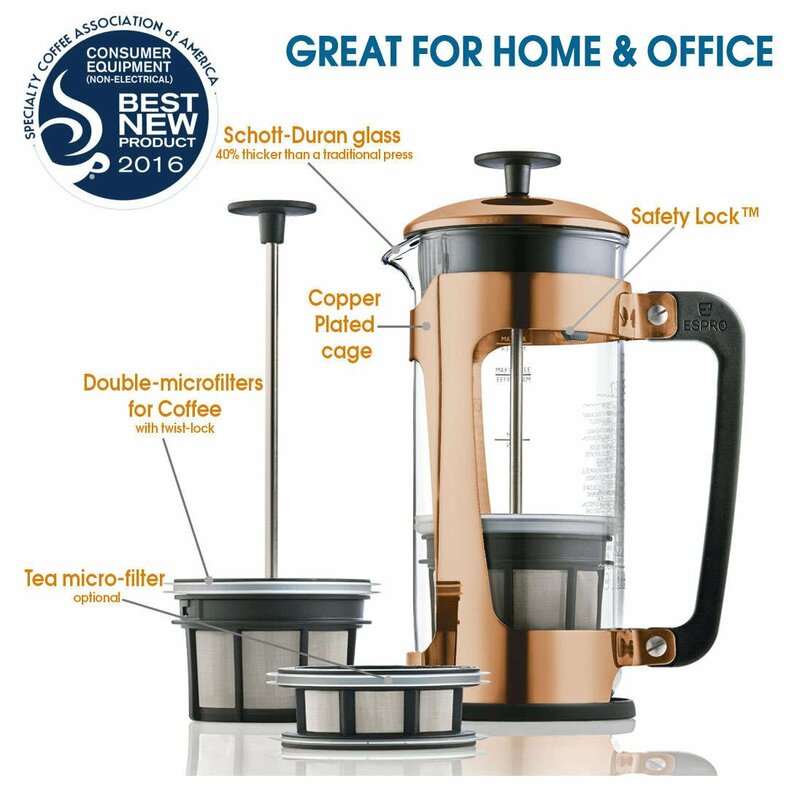 2016 BEST NEW PRODUCT WINNER - Espro Press P5 was named the Best New Piece of Consumer Equipment (non-electrical) 2016 by Specialty Coffee Association of America (SCAA) and WorldTeaExpo 2016 new Product Award winner. THICK & DURABLE GLASS - Beautifully crafted glass carafe made from German Schott-Duran glass that is 40 percent thicker than French Press carafe glass. ESPRO's PATENTED FILTER - Choice between a double Coffee micro-filter (french press coffee) or paper filter. Mesh filters provide French Press-style coffee and paper filters give you delicious pour-over or drip style coffee with reduced cholesterol levels (paper filters absorb coffee oils). Double-tea microfilter automatically sweeps tea leaves into an isolated chamber when done brewing. FREE BONUS - Beautiful 8.5" long handmade wooden stirring spoon. The Espro Press P5 also makes a great gift that keeps on giving. Included with your purchase of this French Press Coffee Maker is the perfect, free accompaniment--a beautifully crafted wooden spoon. 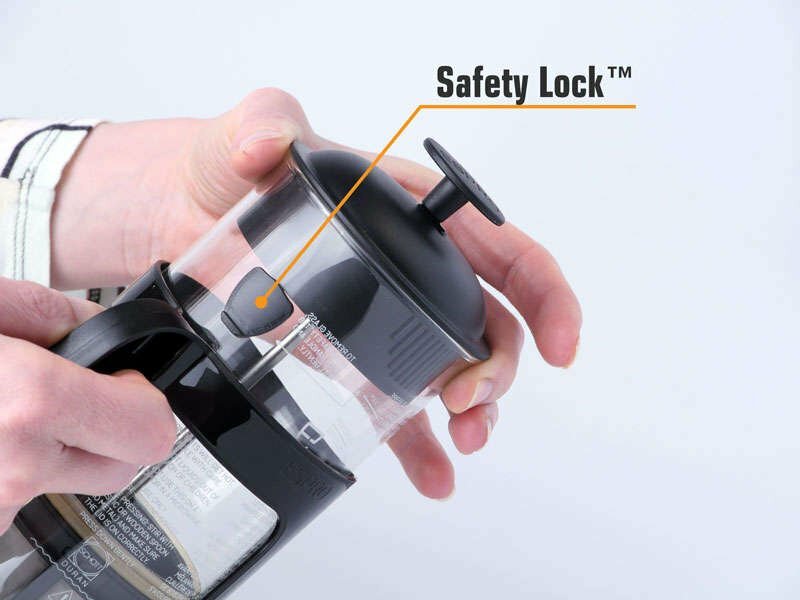 The Espro's patent-pending Safety Lock™ keeps the glass carafe safely inside the stainless steel cage; no slippage while pouring. It is a cut above the old, option-less, delicate french press models of the past. The Espro Press P5 (with Thick & Durable SCHOTT Duran glass) is safer and easier to use than any other French Press Coffee Maker. Espro Replacement Glass Carafe for Espro P3, P5 made in the Schott-Duran factory in Germany, with very high standards and strict quality controls. 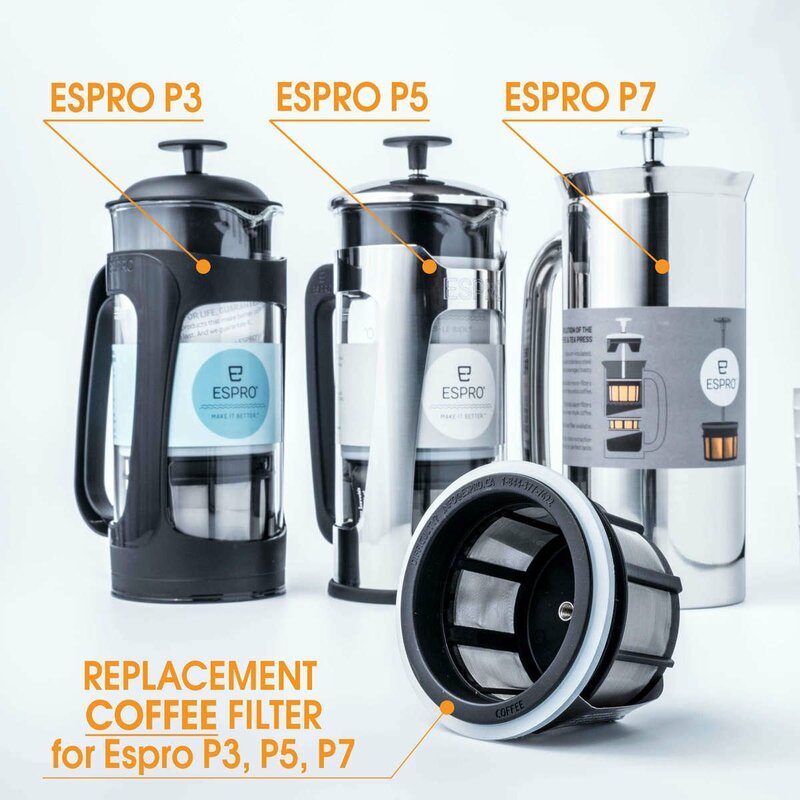 The Espro P5 Glass Press offers a never before designed unique coffee plunger feature -- a superior filtering system with not one but two micro-filters. 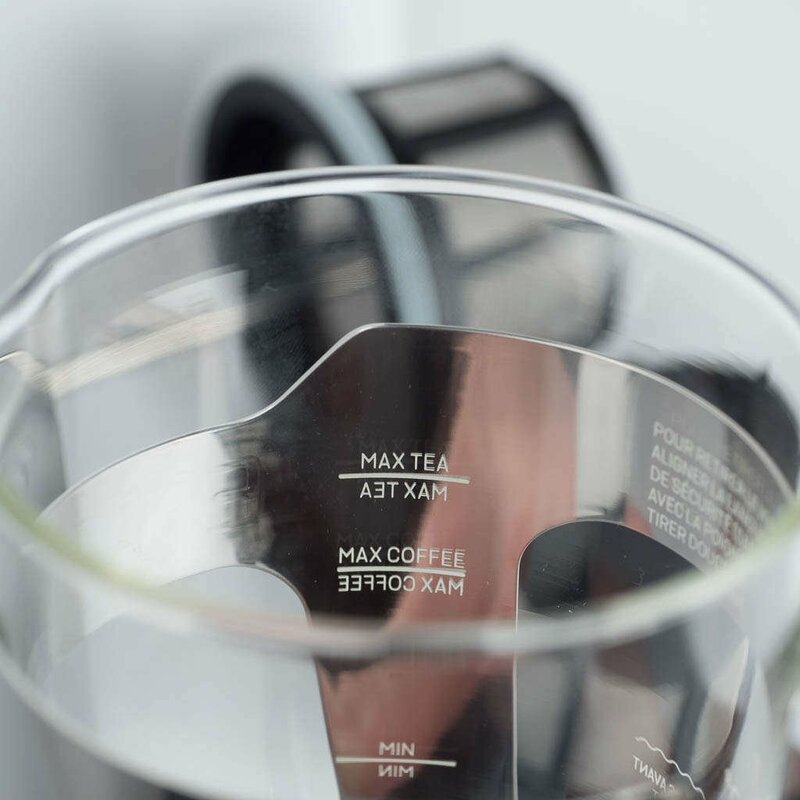 These filters will allow you to brew the perfect cup of coffee or tea. Image a cup of coffee brewed to your very own specifications, no more unwanted grit. Well designed Espro's Patented dual mocro-filters which are easy to use and allow you to brew your coffee without fear of grit ruining your favorite morning ritual. The Espro P5 delivers the best cup of tea available; the filters push the tea leaves downward into a closed, isolated compartment; brewing stops automatically. If you're set on the benefits of an Espro Press you still need to decide which model is right for you. The brand offers a number of different types each with different features and benefits.